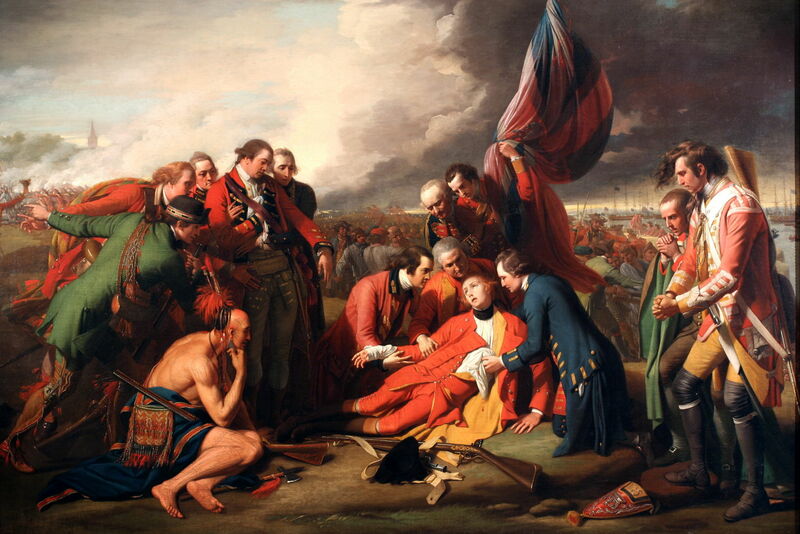 Benjamin West (1738–1820), The Death of General Wolfe (detail) (1770), oil on canvas, 151 × 213 cm, The National Gallery of Canada, Ottawa, ON. Wikimedia Commons. Benjamin West achieved many remarkable things in his life. The tenth child of an innkeeper in Springfield, Pennsylvania, with little formal education, he would hardly have been expected to become an internationally renowned artist, court history painter to King George III, and the second President of the Royal Academy of Arts in England. According to his own accounts, transmitted through John Galt’s biography, from quite early in life West had set out to become a great history painter, later specifically to “occasion a revolution in the art” (words which West apparently attributed to Sir Joshua Reynolds). West considered that he did so by painting to the principle that “the same truth that guides the pen of the historian should govern the pencil of the artist”. This results in what might be termed modern history painting. For all these bold claims, West painted remarkably few works which could, by any stretch of the imagination, be viewed as paintings of modern history in contemporary dress and upholding any form of truth to the event. I have shown just eight in this series, which does omit one or two for which suitable images are not available. 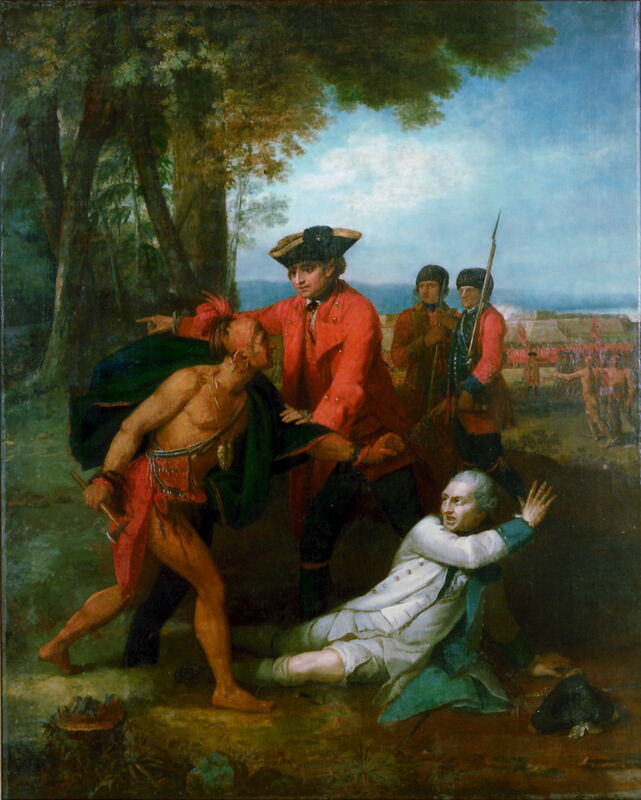 In about 1764-68, West painted one of his first modern history paintings, in his General Johnson Saving a Wounded French Officer from the Tomahawk of a North American Indian. It shows what was then a well-known act of honour, in the Battle of Lake George, on 8 September 1755. The leader of the British colonial troops and Mohawks, General William Johnson, is seen saving the life of his opponent, Baron de Dieskau, the leader of the French and allied troops there, when one of the Mohawks came up to claim Dieskau’s scalp. Although a perfectly sound work, it hardly set the world of history painting on fire. A few years later, West painted his most famous work, showing The Death of General Wolfe (1770), in another scene from the Anglo-French colonial wars, this time outside Quebec on 13 September 1759. General Wolfe had been commanding the British forces in a brief action which was the turning point in that conflict, in which Wolfe was killed. 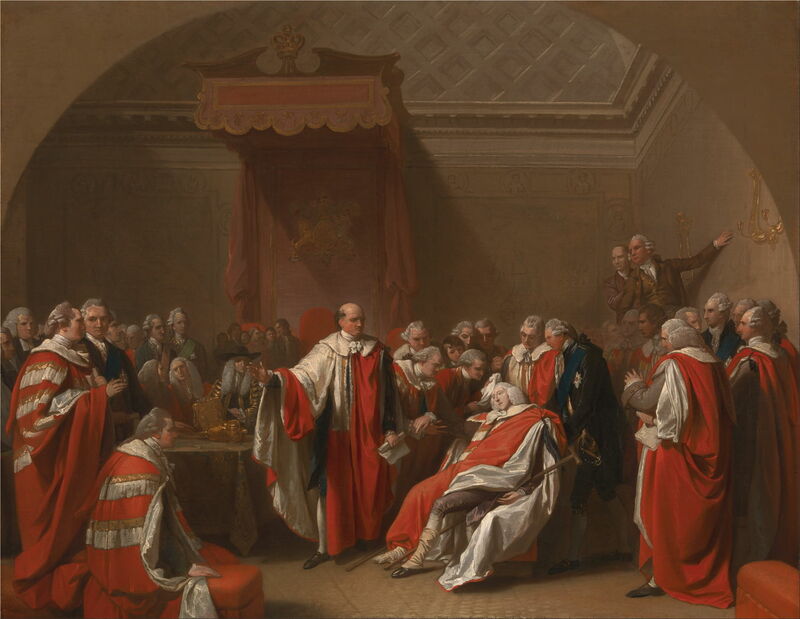 A much more ambitious painting, West succeeded in capturing a spirit of the event, with a strong composition and sense of drama and gravitas. 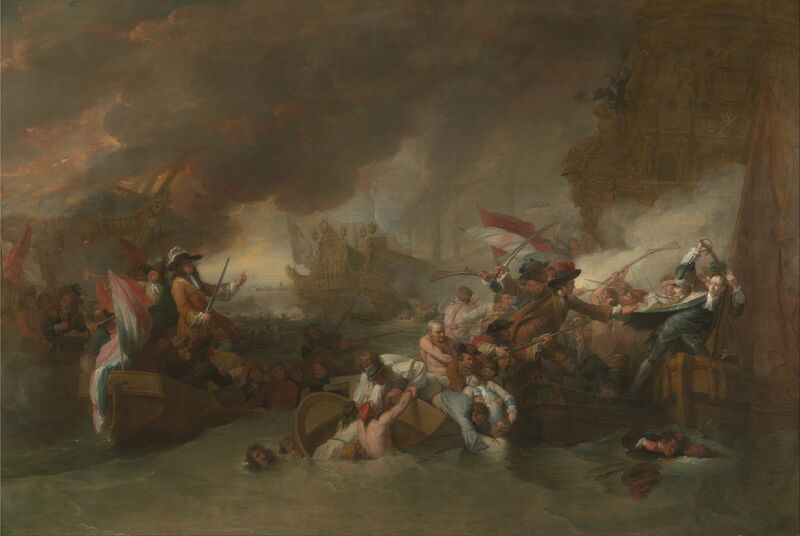 Comparison with contemporary works showing battle scenes fails to demonstrate any particular innovation, though, and it is recognised that much of it is historically inaccurate. 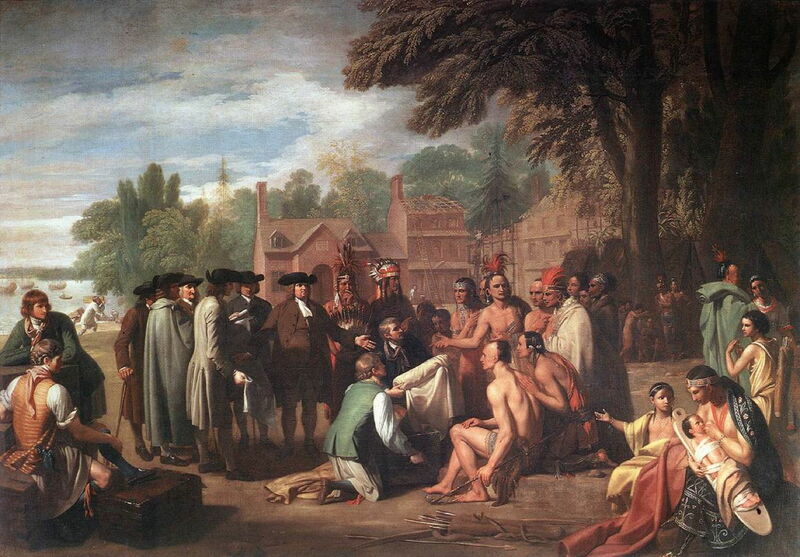 In 1772, West exhibited The Treaty of Penn with the Indians or William Penn’s Treaty with the Indians alongside four more traditional narrative works at the Royal Academy in 1772. This shows the founder of the state of Pennsylvania purchasing land for his colony from the Lenape people, with a treaty of peace between the colonists and the ‘Indians’, in 1682. Although popular at the time, it is narratively far weaker, and fails to tell a clear story. Looking at the directions of gaze of its figures shows that the artist himself had no consistent idea of where they should be looking, for example, and the viewer is hard-put to identify William Penn. In 1778, West turned his attention to The Battle of La Hogue, showing a relatively minor naval action which took place between 21 and 24 May 1692 off the French port of Saint-Vaast-la-Hougue. He captures well the confusion of battle, but leaves the viewer as confused as the scene which he depicts. West’s painting of The Death of Chatham was made immediately after the sudden collapse and later death of William Pitt the Elder, the First Earl of Chatham, in the House of Lords on 7 April 1778. A far cry from his battle scenes, this painting is perfectly good but lacks drama. West was unlucky in having a direct competitor, and his work was quickly forgotten. 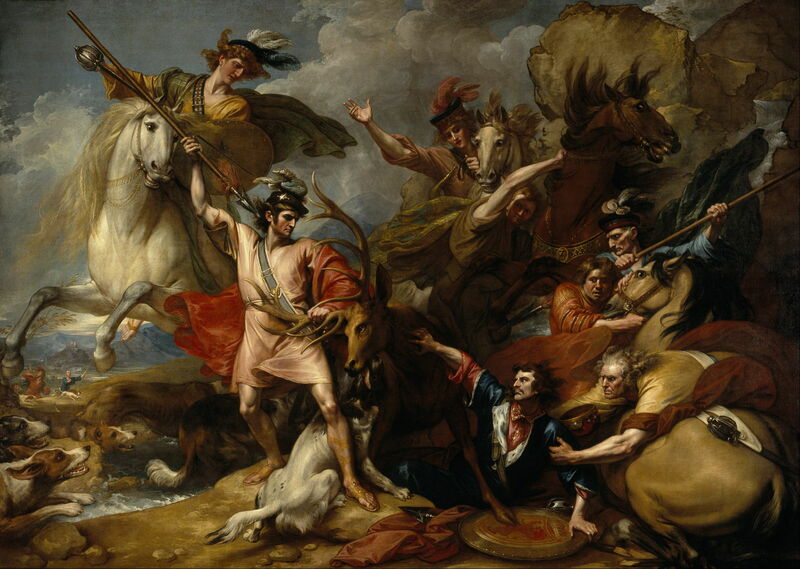 Where West’s earlier modern history paintings lacked action, Alexander III of Scotland Rescued from the Fury of a Stag by the Intrepidity of Colin Fitzgerald, painted in 1786, made up for it. Although this incident, in which the King of the Scots was almost gored by a stag, was far from contemporary – Alexander III lived from 1249-1286 – it is post-classical. West draws the viewer’s gaze to the figure of Colin Fitzgerald, with his spear raised and ready to kill the stag, rather than the prostrate king he is saving. There are parallels with the compositional problems of the Calydonian Boar Hunt, perhaps best solved by Rubens in his Hunt of Meleager and Atalanta of about 1616-20, a painting with which West appears unfamiliar. 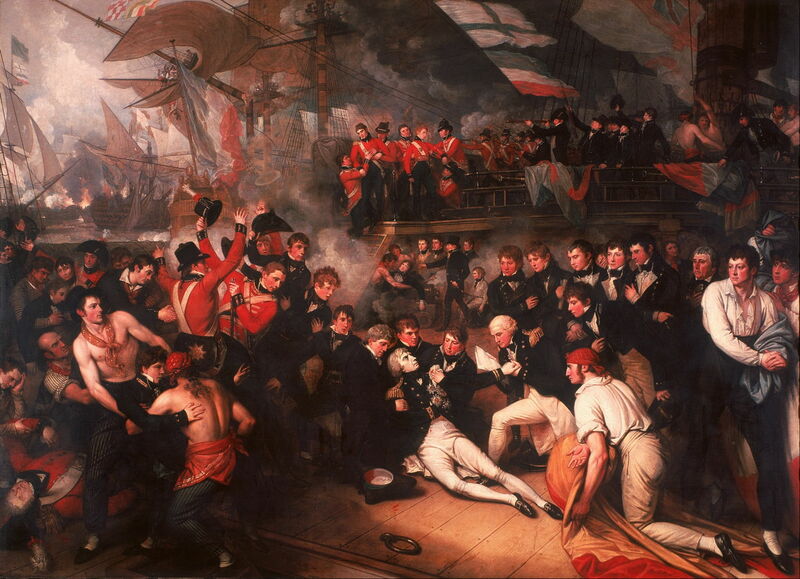 West’s second modern history painting on a grand scale, and of a great hero, is that of The Death of Nelson, completed just a year after the event. Everything about this should have brought lasting fame: like Wolfe, Nelson was the commander, leading victorious forces when he was fatally wounded in battle. The moment was the climax in one of the greatest naval engagements of all time, the Battle of Trafalgar. And, after he had met with many of those present at the time, West’s painting was one of the first to be completed of the scene. Nelson was a celebrated national hero, and to this day is commemorated annually on Trafalgar Day, 21 October. The crowded quarterdeck of HMS Victory shown by West is a very challenging motif. Unfortunately, his composition fails to make Nelson the centre of attention, and surrounding activities, particularly those of the group to the left of centre, appear incongruous with the theme. What could have been one of the great history paintings of the eighteenth century, a lasting image of an evocative moment in British history, leaves the viewer confused. 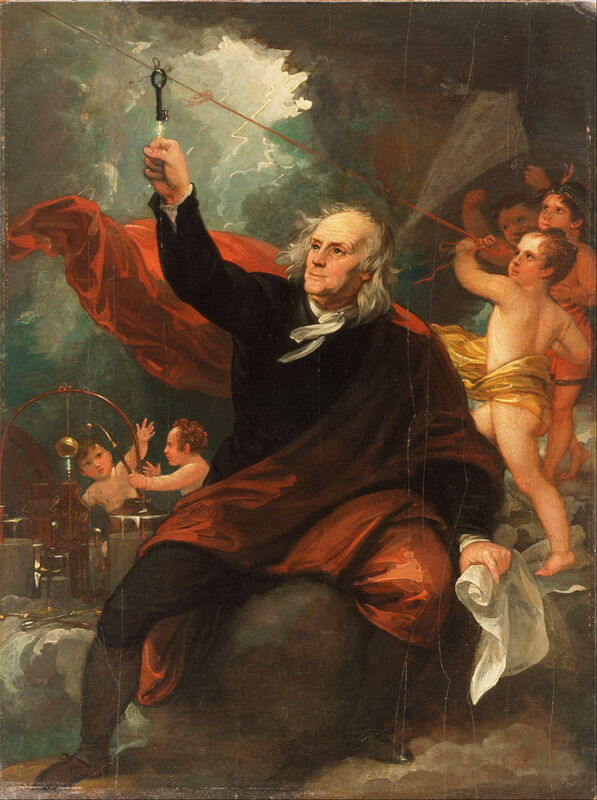 West never intended his study for a larger portrait of his friend Benjamin Franklin to be a modern history painting, but Benjamin Franklin Drawing Electricity from the Sky (c 1816) tells a story about recent events. It turns out to be a legend, in which Franklin allegedly flew a kite in a thunderstorm and observed a spark pass from a metal key on the kiteline to his hand. West’s setting, though, is anything but modern. In this romantic allegorical fantasy, Franklin sits on a platform of clouds, surrounded by naked putti-like children who are pulling on his kiteline and playing with a static electricity generator at the left. Benjamin West did not transform history painting, nor did he establish a new sub-genre of modern history painting, which had already existed for a long time. If any artist of the eighteenth century can claim to have changed history painting, it is surely Jacques-Louis David (1748-1825), who did paint radical depictions of contemporary events, most famously in The Death of Jean-Paul Marat (1793). For all West’s astonishing achievements, he had more than his fair share of bad luck. When he came to Europe, he went to Rome, which at the time had few active artists of note, instead of Paris, where the best history painters were. Instead of undertaking formal studies with one or more masters, he seems to have tried to learn from much looser relationships. When he chose to settle in Britain, he did so at a time when very few British-born history painters of note were active in the country, and when there was little chance of receiving any further training or development in his painting. He doesn’t seem to have taken any time to familiarise himself with the work of great narrative artists such as Rubens, nor to copy those paintings. What guidance and advice he seems to have received, mainly from Joshua Reynolds, was not the best available in Europe at the time. Reynolds was a fine and very successful portrait painter, but his forays into history and narrative painting were far weaker. West’s weaknesses and limitations reflect those of British painting at the time, and were to be addressed to a degree in the development of the Royal Academy and its Schools, for which he was in part responsible. Benjamin West was a self-made artist, a good but not great history painter, whose greatest legacy was probably his work for the Royal Academy, and for giving artists in Britain the opportunities which he lacked in his own training. Posted in General, Language, Life, Painting and tagged David, history, history of painting, myth, narrative, painting, Reynolds, Rubens, West. Bookmark the permalink.